An unremarkable Thursday if I recall. Well that was until this happened: Free Navigation for Life for Nokia Smartphones. I’ll be honest, I was a bit bummed. One of the appeals of choosing the 6710 Navigator, was that at that price point, it was the only Symbian phone that came with a 2 year drive licence. Had I known what Nokia was planning to roll out free navigation for life! Jokes aside, removing licence fees for Ovi Maps was a game changer for Nokia. I often here Maps referred to as the jewel in Nokia’s crown, and in all honesty it is the best application you can find for Symbian. That day, not only were a handful of current devices and all future devices going to have free Navigation, we were also treated to an updated application that added a number of enhancements, like weather and guides. The evolution of Maps from v3, to the free v3.3 release to the current commercial 3.6 or for the brave the superb 3.8 beta (now rebranded as Nokia Maps) has been startling to watch. Along the way, I have noticed UI refinements for a better touch experience, the addition of more partners for guides leading to an improved points of interest (POI) database, a new weather application, check-in options to foursquare and more, and the ability to download maps directly to device over WiFi, truly ‘post-PC’. Moreover, the have been under the hood improvements to the search facility, live traffic, and improved rerouting. The routing algorithm must also have been refined along the way, because in the 3.8 beta it is incredibly logical even more so when coupled with live traffic updates. And let us not forget that unlike standalone units, map data is free for life too. Maps has certainly gotten a lot of use from me, and saved me a lot of Rands in that I have never ever thought about buying a standalone GPS unit since. I have compared it directly to my in-laws admittedly no aging Garmin and I have to say that the Maps of 2011 is a stellar experience, leveraging the power of mobile with regards to connectivity, to provide a rich and immersive on device experience that goes beyond the primary role of navigation. But it’s not just about the software. The Maps experience was fine on the small transflective 2.6″ QVGA LCD display of the 6710 Navigator but once I upgraded to the 3.5″ nHD AMOLED display of the N8, and aided by more powerful internals it was a different ball game. 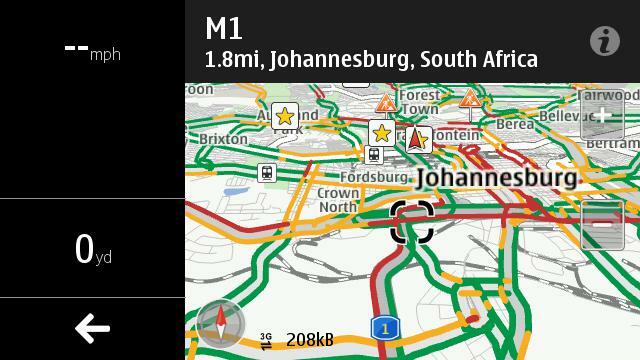 Maps was built for a powerful device like the N8. What the N8 brings to the table is an excellent display both in terms of size and quality. Yes it could so with an extra 0.5″ and Nokia’s famed clear black display (CBD) technology but it is still excellent nonetheless. At all levels, brightness, contrast and general visibility in direct sunlight, the N8 does a great job. And the speaker is equally impressive. Yes it a single mono unit but it is loud and the clarity is immense. I didn’t think much of this until I used the E7 in the car and realized just how much louder, especially when cradled in a car mount the N8 is. Same with the SGSII. The N8 knocks those more expensive devices out of the park. And speaking of car mounts, accessorize! I purchased the Cr-122 multi-phone car mount, and of course the N8 comes with a car charger. The CR-122 is a great unit, incredibly well constructed and the suction keeps it mounted tightly to the windshield of the car, and it’s cradles both the N8 and E7 well. In my humblest opinion, the N8 and Nokia Maps (with the CR-122 and car charger) is a powerful companion for anyone looking for a complete in-car navigation system. Maps has been a veritable tour de force for Navigation software, and so many of the N8s design consideration make it fit for purpose. The Nokia N8 – The Perfect Guide. ← Gravity: A Cure For Social Network ‘Check-In’ Fatigue? Ovi Maps, or Nokia Maps as it is now called, is an indispensable tool for me. I sold my HTC Desire HD within a few days – and purchased an N8 because the navigation system was simply not on par.